I’ve written about Kiera’s CMR before, as it’s the ultimate goal for wearable technology. The outfit allows her to scan for fingerprints, bloods, and other fibers; measure someone’s blood pressure to gauge if someone is lying (her high-tech contact lenses also help); she can also absorb bullets, communicate directly with Alec, and become invisible. I totally want one for Christmas. Beyond that, there are tabletop computer displays, cyborg-style sensory and memory implants, data/video recorders, folding guns, chemical and biotech enhancements, hacking galore, and any futuristic technology a police officer or boy genius could want to play with, and yes, it’s awesome. Revolution is great, the second season especially what with the ‘nano’s absorbing all the electricity which is why there’s no power! Continuum makes a future prediction about a ‘Global Corporate Congress’ running the North American Union (NAU) an economic and political union of Canada, Mexico, and the United States. This kind of prediction has been speculated for some time. Usually by the tinfoil hat crowd. Now, with a Supreme Court that’s fast-tracking the belief of corporate personhood or ‘corporations are people’ the next step is corporations running for public office. Did you notice they were investigating Sonmanto which sounds an awful lot like monsanto? I about died laughing- and wondered if anyone else made the connection. 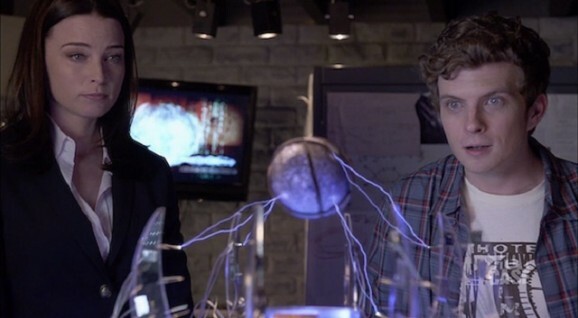 I like Continuum….glad they’re continueing it. …of the names mentioned, Falling Skies and Under The Dome are really good sci-fi shows. Sorry, I tried watching it, and I watch lot of Sci-Fi, but it was soooo boring. Thanks for the heads up on the UK version. If I knew there was a UK version before, I must’ve forgotten. I can’t wait to check it out. The author said Almost Human, not Being Human. Different show. Being Human was the vamp, the wolf, and the ghost- and it was awesome. I never saw Almost Human so I don’t even know if it was good or not. Is it really necessary to take a swipe at creationists? Oh man I did the same damn thing with Helix….I WANTED to get into it….but my goodness if the plot line made no sense whatsoever. I’m not sure what’s up with the beginning knock on Revolution. I watch The Blacklist, Revolution, AND Continuum as well as Falling Skies. I love them all equally, and I really love Continuum! I think they’re all great shows. Strange poke there…as others said, there’s nothing really wrong with Revolution, NBC is just retarded. Literally. The mass just wants brainless content like reality and talent shows. Die hard fans of shows with story or breadth just aren’t as big these days, it’s really sad. continuum is great. not just because its an awesome show.. but ALSO because of the state of the USA right now. whether people want to see it or not.. we are slowly but surely losing our freedoms.. patriot act, HR 347, and sections 1021 and 1022 of the NDAA bill are just a few examples.. and dont take my word for it.. do the research yourself. I can agree Continuum is a great show. But so is Revolution and Falling Skies, you may want to give them another shot. But it looks like NBC is going to leave us hanging on Revolution. I really enjoyed Revolution. It got off to a really slow start, but if you start halfway through the first season (when they rescue her brother) it gets really good.